That’s a pretty big opening statement, but I know that it is true on many levels. Certainly, cooks make a difference in the lives of restaurant guests who are looking for an experience, a reward, a mind-blowing meal, or just a forum for bringing friends and family together. This is, after-all, what restaurants hire cooks to do. The intent of this article is to look at making an even more significant difference. Although monetary donations certainly fit within the parameters of this definition, there is something just as valuable, if not even more, than money. Individually, what do we have that far outweighs how much money is in our bank account? Our time and our expertise can never be valued strictly in monetary terms; to this end, both are priceless gifts that we can offer. Cooks are blessed with the ability to understand food, comprehend flavor, and know how to nurture raw ingredients as they convert them to a finished dish. What every cook has the potential and ability to offer humankind is an understanding of food and how to prepare it. Every cook has a wealth of knowledge that can be shared with those who lack that understanding, not the ability. True philanthropy is giving of “charitable aid” without need for quid pro quo. Giving of a cooks time and expertise is philanthropy that keeps on giving. By now, most people are aware that what and how we eat impact many of life’s ailments. Heart disease, diabetes, some forms of cancer, obesity, and dozens of other plagues of mankind are triggered by food and nutrition. I have read numerous articles that try to place blame on various stakeholders in the food chain: restaurants (especially quick service), food manufacturers, grocery stores, television, busy lifestyles, sub-standard income, or even claims that people are simply lazy eaters. I tend to take the high road and believe that the real culprit is that people simply don’t know how to cook anymore. Dependence on convenience foods is not simply because they are inexpensive, a well planned out weekly menu can be economical as long as people understand what to do with food and which foods are beneficial. Restaurant cooks understand this, even though they may not stop and think about this knowledge as a transferable gift. Convenience is an excuse, many times for a lack of knowledge or experience. Not too long ago (two generations back), the skill of cooking was something that each generation passed on to their children. Those treasured recipes and bullet proof processes of cooking were something that was, of course, the responsibility of a parent to pass on. At some point in time, cooking as a necessary skill became far less important. Sociologists can argue about how this came about or what drove this significant change, but all will agree that it did happen. Now we are left with a generation that in many cases would prefer to make a reservation than cook. Aside from the nutritional benefits of well-prepared meals from scratch, cooking can be, and is – fun! This lack of understanding how to cook is not socio-economic, although it is more prevalent among the poor. Those who have the economic means have large kitchens and all the tools, but lack the ability; while those who tend to have fewer resources claim that cooking from scratch is too expensive. Restaurant cooks have an opportunity to make things right and bring the joy of cooking back to the home. We all know a family, regardless of their socio-economic situation, that simply doesn’t cook. Look around, start with your own extended family or maybe your friends. Make the offer: “How would you like to learn more about cooking? I would love to share some of what I know with you and your family.” Dedicate a few hours every month to build their skills. Work with them in their home kitchen. Help them plan a menu for the week, make their shopping lists, join them in the grocery store to demonstrate how to select great ingredients. Cook with them and sit down to a meal with their family. Talk about food – make it exciting and re-create the experience that you know from time in restaurants. Talk with your local community center about using their facilities for a public session and tasting of easy to make, fresh meals. Provide a recipe that they can take home. Do this once every other month. Build it into your calendar. 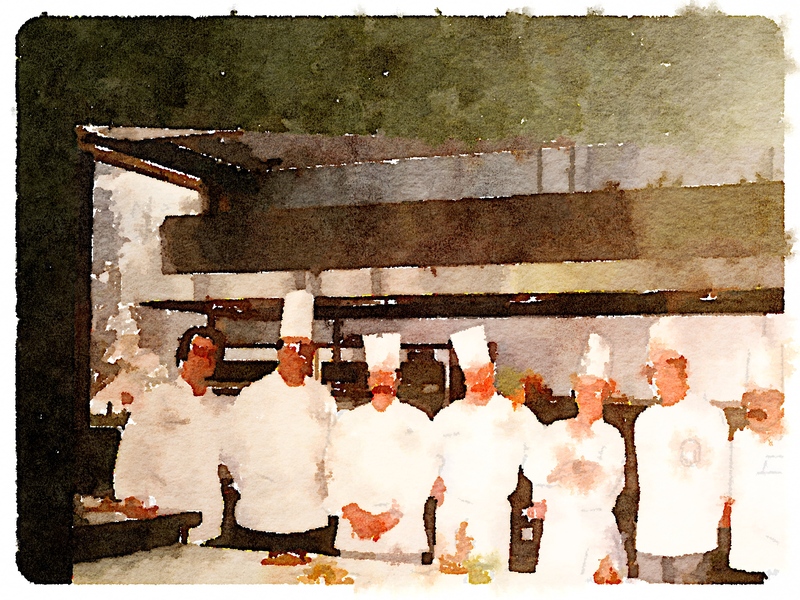 Suggest that the owner or chef allow you the opportunity to provide a class in the restaurant. “How we prepare…..(a certain popular item on the menu).” This community offering would provide the side benefit of great exposure for the restaurant. Soup kitchens are filled with people with good hearts, hoping to help those in need. They may not have the cooking expertise that you have, so train-the-giver and impact the lives of all who are on the receiving end. Offer to write a cooking column in your local paper. Make the column fun and easy to follow. Offer one day every few months to help shoppers make better decisions in the grocery store. Talk with the store operator about embracing this idea, show up in your kitchen whites, hand out recipes that the store provides, and become an ingredient guide for those who need a professional’s advice. Work with the staff in local school cafeterias helping them build their skills and offer healthy food sample alternatives to young people who are learning to build their palates. Some of you might say (understandably so) that the demands of your current job are so significant that you don’t have time to do this. I can only say that where there is a will, there is a way. Cooks may not have the ability to write a check to help those in need, but the gift of their time and talent will always be just as significant. Inherently, people like to give and make a difference; this is a way to do so. Cooks as philanthropists, isn’t this a great idea? ← COOKS ARE UNITED – ENOUGH WITH THE SCREAMING CHEF!